vitamini handmade: Decorating for Christmas without a tree. I LOVE decorating for Christmas. Funny enough, though, I never had an actual Christmas tree until 4 years ago! We always had a family tree, but I never had one when I was in college. After I was done with school I was mostly living in tiny apartments and wasn't there during Christmas, anyway. Even still, I always managed to get my place looking festive for the holidays. 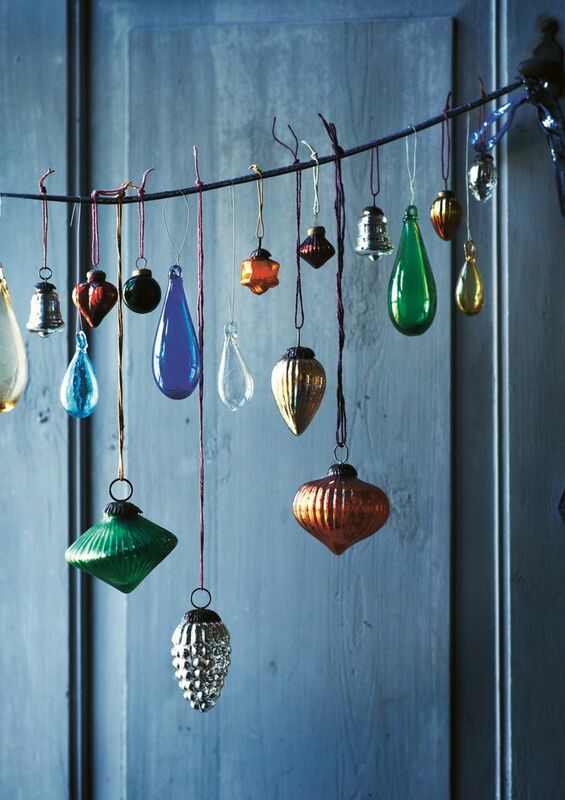 Here are a few decorating ideas if you decide to go sans tree this year! 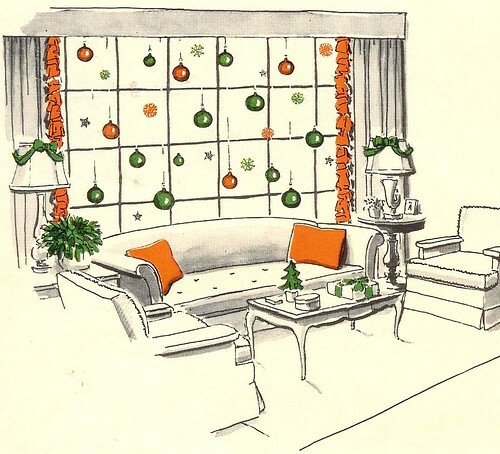 I had so much fun hanging ornaments in my window one year. I bought a few fancy ones and then filled in with simpler glass ornaments in between. Hang them at varying heights and tie them up with different colors of ribbon and twine. You can use fishing line if you want to go for the floating look. Instead of hammering a bunch of nails into the wall, just loop a line across the window horizontally, anchoring at each end with 3M hooks. Tie the individual ornament lines to that at the desired spacing. I love the look of this! All you need is a large demijohn or two and some branch cuttings. After that, string it up with garlands and glass ornaments. So pretty! You could even do this on a smaller scale for a table centerpiece. Try asking your local tree lot if they have cuttings for sale. They may just give them away! I've been seeing lots of these graphic tree hangings around the internet and think they're such a clever idea. If you're short on space (like I was for so many years) this option doesn't take up any room and gives you a nice spot to pile up gifts. 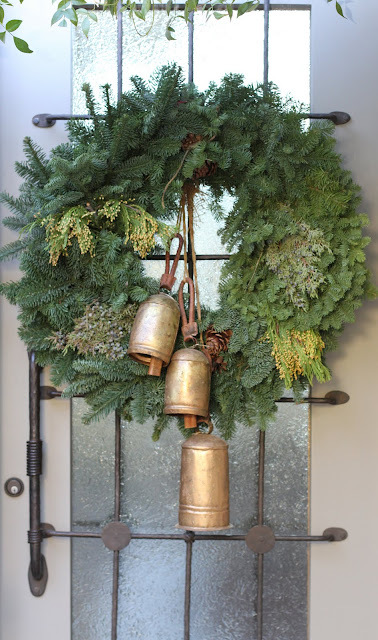 You can always pickup an evergreen wreath or garland to get that pine scent without the hassle of a tree. You don't even have to water it! Of course, I'd end up decorating it with ornaments, but they are lovely all on their own, too. 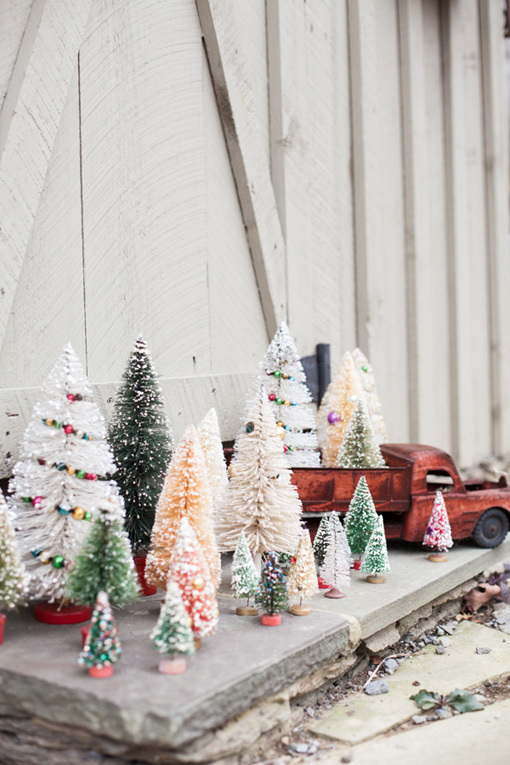 Get your tree fix with a bunch of minis! There are so many cute bottle brush trees in stores right now. Pick up a few and make a little winter scene on a bookshelf or tabletop. Fill in with artificial snow, little houses, and (my favorite) little cars. Do you ever go without a tree for Christmas? What are your favorite decorating techniques?